Ahlam Shibli, untitled (Dom Dziecka. The house starves when you are away no. 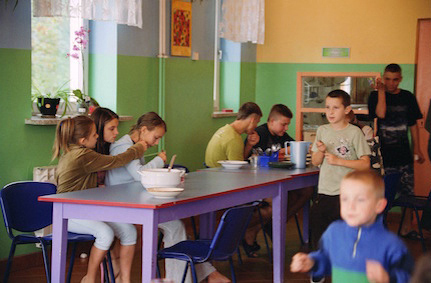 1), Poland, 2008, chromogenic print, 38 x 57.7 cm. Dom Dziecka Na Zielonym Wzgórzu, Kisielany-Żmichy, May 19, 2008, Monday morning. Darek Wróbel and Kamil Jasielewicz are the last in line to get on the bus for school. Ahlam Shibli, untitled (Dom Dziecka. The house starves when you are away no. 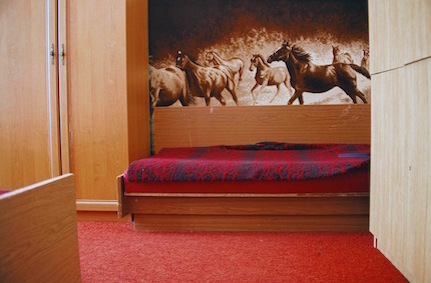 2), Poland, 2008, chromogenic print, 38 x 57.7 cm. Dom Dziecka Lubień Kujawski, May 17, 2008, Saturday afternoon. Paulina P. and Jula R. playing in the yard of the children's home. Ahlam Shibli, untitled (Dom Dziecka. The house starves when you are away no. 3), Poland, 2008, gelatine silver print, 38 x 57.7 cm. Dom Dziecka Lubień Kujawski, October 9, 2008, Sunday afternoon. 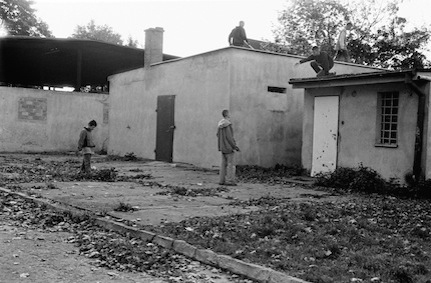 Patryk P., Adrian Z., Łukasz Z., Marcin W., and Dawid C. playing and hanging out in the yard of the children's home. Ahlam Shibli, untitled (Dom Dziecka. The house starves when you are away no. 4), Poland, 2008, gelatine silver print, 57.7 x38 cm. Dom Dziecka Trzemiętowo, October 7, 2008, Tuesday afternoon. 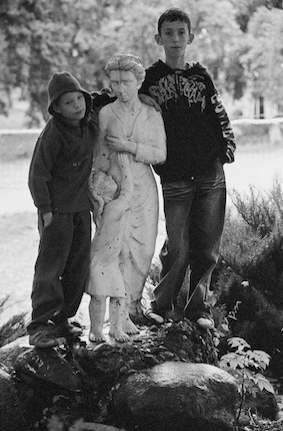 Gracjan Schmelter and Tomasz Brządkowski posing for the camera with a sculpture in front of the entrance of the children's home. Ahlam Shibli, untitled (Dom Dziecka. The house starves when you are away no. 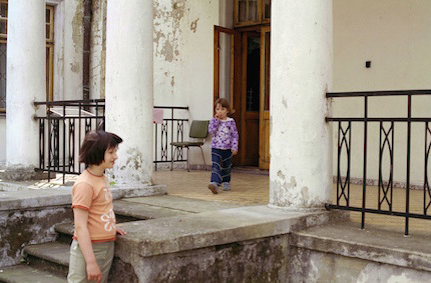 5), Poland, 2008, chromogenic print, 38 x 57.7 cm. Dom Dziecka Na Zielonym Wzgórzu, Kisielany-Żmichy, May 19, 2008, early Monday morning. 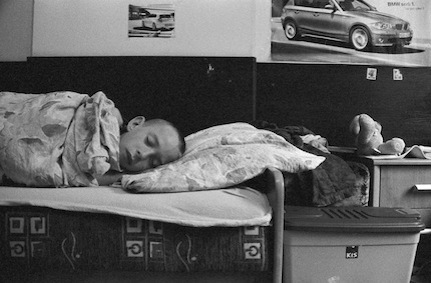 Stanisław Trochimiak waking up for school. Ahlam Shibli, untitled (Dom Dziecka. The house starves when you are away no. 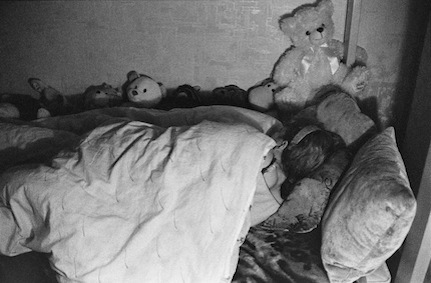 6), Poland, 2008, gelatine silver print, 38 x 57.7 cm. Dom Dziecka Trzemiętowo, October 6, 2008, Monday evening. Sylwia Schalau sleeping after her evening shower. Ahlam Shibli, untitled (Dom Dziecka. The house starves when you are away no. 7), Poland, 2008, gelatine silver print, 38 x 57.7 cm. Dom Dziecka Lubień Kujawski, May 16, 2008, Friday afternoon. Adrian Z. arranging his bed. Ahlam Shibli, untitled (Dom Dziecka. The house starves when you are away no. 8), Poland, 2008, gelatine silver print, 38 x 57.7 cm. Dom Dziecka Na Zielonym Wzgórzu, Kisielany-Żmichy, September 28, 2008, late Sunday morning. In the adults' room, Michał Brodacki, Andrzej Radzikowski, and Darek Wróbel, room partners, are sleeping. Ahlam Shibli, untitled (Dom Dziecka. The house starves when you are away no. 9), Poland, 2008, gelatine silver print, 38 x 57.7 cm. Dom Dziecka Na Zielonym Wzgórzu, Kisielany-Żmichy, September 29, 2008, early Monday morning. Ahlam Shibli, untitled (Dom Dziecka. The house starves when you are away no. 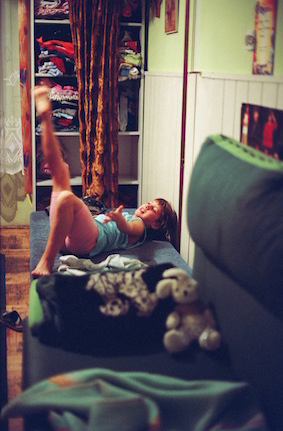 10), Poland, 2008, chromogenic print, 38 x 57.7 cm. Specjalny Ośrodek Szkolno-Wychowawczy, Baczków, May 29, 2008, Monday afternoon. Ahlam Shibli, untitled (Dom Dziecka. The house starves when you are away no. 11), Poland, 2008, chromogenic print, 38 x 57.7 cm. Before school, Asia Trojanowska is waiting for her turn to comb her hair. Ahlam Shibli, untitled (Dom Dziecka. The house starves when you are away no. 12), Poland, 2008, gelatine silver print, 38 x 57.7 cm. Dom Dziecka Lubień Kujawski, October 9, 2008, Sunday evening. 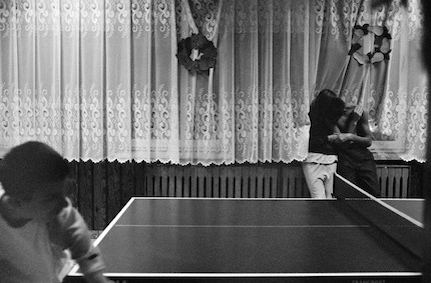 Paulina O. and Damian Z. kissing, while Emil K. is playing ping-pong. Ahlam Shibli, untitled (Dom Dziecka. The house starves when you are away no. 13), Poland, 2008, chromogenic print, 38 x 57.7 cm. Dom Dziecka Radoryż Smolany, September 25, 2008, Thursday afternoon. Katarzyna Żakowicz having her lunch, while Mrs. Sylwia Świętochowska-Posiadała, a caretaker, has her lunch at the next table. Ahlam Shibli, untitled (Dom Dziecka. The house starves when you are away no. 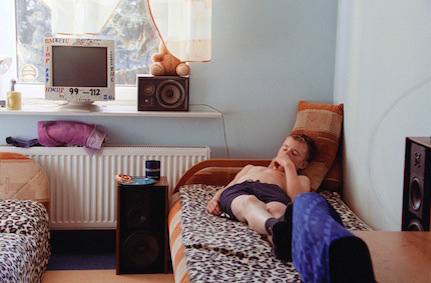 14), Poland, 2008, chromogenic print, 38 x 57.7 cm. Dom Dziecka Radoryż Smolany, September 25, 2008, Thursday evening. Agnieszka Budziak offering chocolate to Piotr Garbacik while he is having his evening shower. Marek Nowicki is taking another piece of chocolate. Ahlam Shibli, untitled (Dom Dziecka. The house starves when you are away no. 15), Poland, 2008, chromogenic print, 57.7 x38 cm. Dom Dziecka Lubień Kujawski, May 15, 2008, Friday afternoon. Children cleaning the children's home: Angelika P. and Michał I. collecting the trash after sweeping the corridor while Paulina P. and Kasia K. are running toward the kitchen. Ahlam Shibli, untitled (Dom Dziecka. The house starves when you are away no. 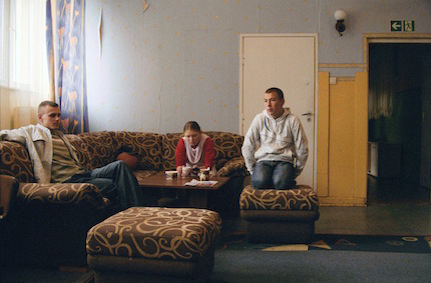 16), Poland, 2008, chromogenic print, 38 x 57.7 cm. Dom Dziecka Lubień Kujawski, May 17, 2008, Saturday evening. Kasia K., Zosia K. and Dagmara S. reading a book together in their free time. Ahlam Shibli, untitled (Dom Dziecka. The house starves when you are away no. 17), Poland, 2008, chromogenic print, 38 x 57.7 cm. Dom Dziecka Na Zielonym Wzgórzu, Kisielany-Żmichy, September 28, 2008, Sunday evening. Stanisław Trochimiak has returned from a weekend visit to his parents, and Darek Wróbel is looking at what he brought from home. Ahlam Shibli, untitled (Dom Dziecka. The house starves when you are away no. 18), Poland, 2008, chromogenic print, 38 x 57.7 cm. Katarzyna Garbacik petting Andżelika Pytlik's hamster and Andżelika Pytlik demonstrating how to hold it. Ahlam Shibli, untitled (Dom Dziecka. The house starves when you are away no. 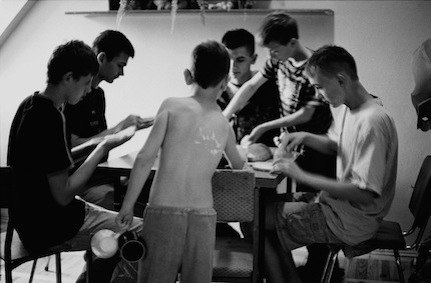 19), Poland, 2008, gelatine silver print, 38 x 57.7 cm. Dom Dziecka nr 7, Łódź, October 12, 2008, Sunday afternoon. 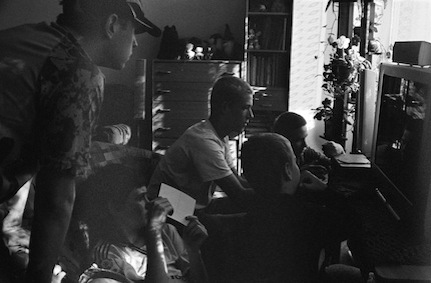 Daniel Banaszkiewicz, Kamil Dubieński, Kamil Kieras, and Marcin Ubych playing a PlayStation game in their free time. Przemek Rogalski, a guest from the neighborhood and a friend from school, is watching. Ahlam Shibli, untitled (Dom Dziecka. The house starves when you are away no. 20), Poland, 2008, chromogenic print, 38 x 57.7 cm. Dom Dziecka Na Zielonym Wzgórzu, Kisielany-Żmichy, September 27, 2008, Saturday afternoon. Anna Trojanowska is washing her delicate clothes by hand, while Magdalena Zubek and Roksana Jeronimiak are comforting each other. Ahlam Shibli, untitled (Dom Dziecka. The house starves when you are away no. 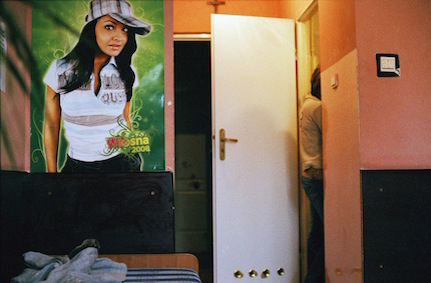 21), Poland, 2008, chromogenic print, 38 x 57.7 cm. Dom Dziecka Lubień Kujawski, May 15, 2008, Thursday at noon. In the dining room, Paulina P., Kasia K., Bartek K., and Adrian Z. are having their lunch while Dawid C. is joining the group. Przemek K., who is in charge that day of organizing the tables for lunch, is talking to Mrs. Krysia, kitchen worker, and pointing to Krzysiek Z., who is turning to them with his hand covering part of his face. Ahlam Shibli, untitled (Dom Dziecka. The house starves when you are away no. 22), Poland, 2008, gelatine silver print, 38 x 57.7 cm. Dom Dziecka Równe, September 30, 2008, Tuesday evening. 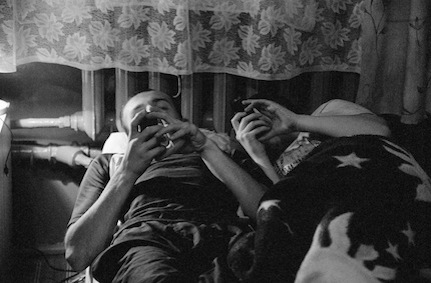 Regina Kurek and Piotr Michalak, a couple, each playing a game on their cell phones on Regina Kurek's bed, before separating for the night. Ahlam Shibli, untitled (Dom Dziecka. The house starves when you are away no. 23), Poland, 2008, gelatine silver print, 38 x 57.7 cm. Emil K., Jula R., Dagmara S., and Bartek K. spending time together in the TV/computer room. Ahlam Shibli, untitled (Dom Dziecka. The house starves when you are away no. 24), Poland, 2008, gelatine silver print, 38 x 57.7 cm. Dom Dziecka nr 6, Łódź, May 25, 2008, Friday after school. 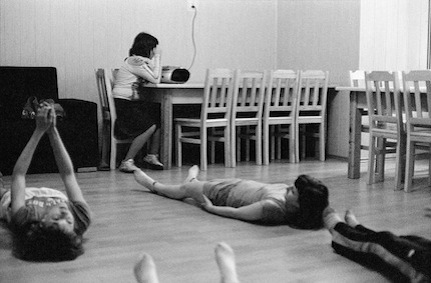 Ola Staniszewska is in charge of the music, while Paulina Gondek, Martyna Madajczuk, and others are rehearsing a group dance during their free time. Ahlam Shibli, untitled (Dom Dziecka. The house starves when you are away no. 25), Poland, 2008, gelatine silver print, 38 x 57.7 cm. Dom Dziecka Lubień Kujawski, May 18, 2008, Sunday afternoon. 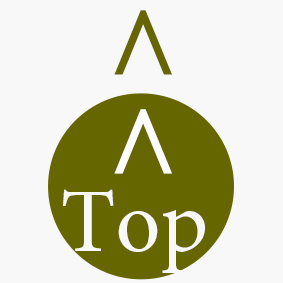 During a family visit, Mrs. and Mr. R., mother and father, accompanied by their nephew, are visiting their two kids, Jula and Franek R. They are all sitting on the carpet in their children's room, surrounded by bagels, sweets, and soft drinks the parents have brought with them. Ahlam Shibli, untitled (Dom Dziecka. The house starves when you are away no. 26), Poland, 2008, gelatine silver print, 38 x 57.7 cm. Dom Dziecka Morą g, May 10, 2008, Friday evening. Mirek Obłoza, Mateusz Czechowski, and Patryk Czechowski dressing after shower, while Radek Czechowski looks on. Ahlam Shibli, untitled (Dom Dziecka. The house starves when you are away no. 27), Poland, 2008, gelatine silver print, 38 x 57.7 cm. 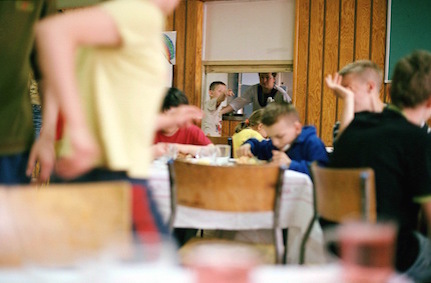 For supper, the children are divided into small groups and each group is responsible for its own meal. Przemek K. is serving Adrian Z., Damian Z., Łukasz Z., Dawid C., and Marcin W.
Ahlam Shibli, untitled (Dom Dziecka. The house starves when you are away no. 28), Poland, 2008, gelatine silver print, 38 x 57.7 cm. Dom Dziecka nr 11, Warszawa, May 30, 2008, Friday afternoon. 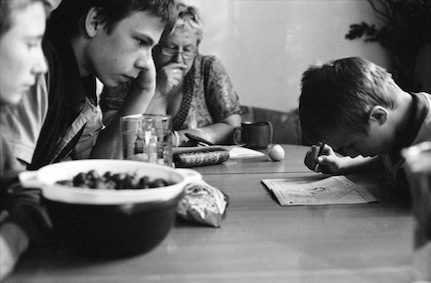 Mrs. Małgorzata Rzodkiewicz, the caretaker and director, working on the home's bills, with Mateusz Pazio doing a Sudoko and Waldemar Dźwigalski and Sebastian Ciborowski looking at his answers. On the table, a bowl of cherries on the occasion of Polish Children's Day. Ahlam Shibli, untitled (Dom Dziecka. The house starves when you are away no. 29), Poland, 2008, chromogenic print, 38 x 57.7 cm. Dom Dziecka Równe, September 30, 2008, Tuesday afternoon. 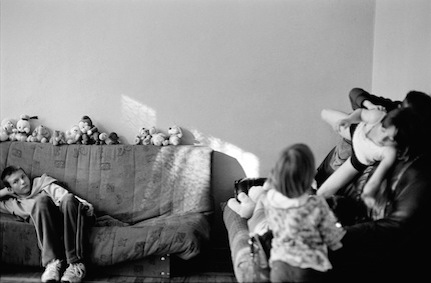 Mr. Adam Narowski, caretaker, with Aneta Pogonowska and Jakub Bereda in the sitting room of the children's home after they have finished their homework. Ahlam Shibli, untitled (Dom Dziecka. The house starves when you are away no. 30), Poland, 2008, chromogenic print, 38 x 57.7 cm. Dom Dziecka Na Zielonym Wzgórzu, Kisielany-Żmichy, September 28, 2008, Sunday afternoon. 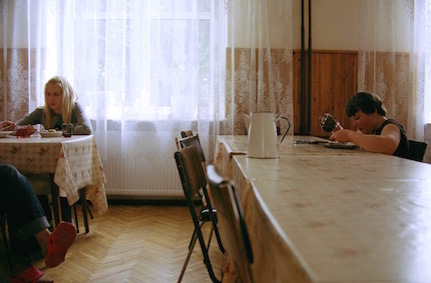 During lunch in the dining room, Roksana Jeronimiak, Magdalena Zubek, and Emilia Dmowska share a chair, while Jakub Urbański and Adrian Bieniak sit at the end of the table. Daniel Kopeć, Krzysztof Zubek, and Tobiasz Perkuć have returned their empty plates and are walking back to their seats. Ahlam Shibli, untitled (Dom Dziecka. The house starves when you are away no. 31), Poland, 2008, chromogenic print, 38 x 57.7 cm. Dom Dziecka Radoryż Smolany, September 26, 2008, Friday afternoon. Mateusz Pytlik, Agnieszka Cizio, Jakub Kamecki, Agnieszka Budziak, Łukasz Pytlik, Adam Bartczak, Weronika Matusik, Piotr Garbacik, Łukasz Soćko, Małgorzata Budziak, and Mariusz Domański are praying after lunch. Ahlam Shibli, untitled (Dom Dziecka. The house starves when you are away no. 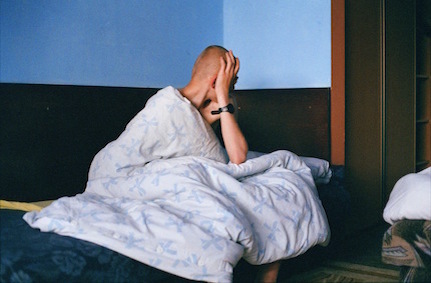 32), Poland, 2008, chromogenic print, 38 x 57.7 cm. Dom Dziecka Trzemiętowo, May 13, 2008, Tuesday afternoon. Piotr Zakurzewski scratching his arm while doing his homework. Mrs. Małgorzata Piątek, caretaker, is helping Rafał Szmelter with his homework and Jza Gdaniec is playing on the computer. Czesław Litwicki and Magda Ochmann are sitting on the sofa waiting for help with their homework. Ahlam Shibli, untitled (Dom Dziecka. The house starves when you are away no. 33), Poland, 2008, chromogenic print, 38 x 57.7 cm. Dom Dziecka Równe, September 29, 2008, Monday afternoon. 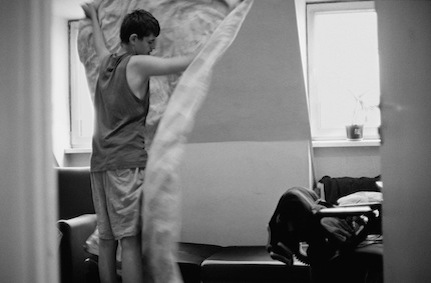 Arkadiusz Drozd changing his school clothes before lunch. Ahlam Shibli, untitled (Dom Dziecka. The house starves when you are away no. 34), Poland, 2008, chromogenic print, 57.7 x 38 cm. Dom Dziecka Julin w Kaliskach, Kaliska, October 2, 2008, Thursday morning. Ewelina Fraczek dressing for school. Ahlam Shibli, untitled (Dom Dziecka. The house starves when you are away no. 35), Poland, 2008, chromogenic print, 38 x 57.7 cm. Dom Dziecka Morą g, October 4, 2008, Saturday morning. Krzysztof Żondlowski lying on his bed.